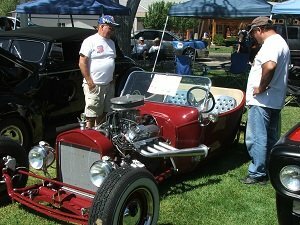 The 33rd annual Early Iron Festival (2013) will be held in Cole Park in Alamosa on Labor Day weekend. What a spectacular car show this is to see! If you love looking at old antique cars then this is the place for you! This is a free event open to the public. The only requirements are that the viewers not touch any of the vehicles on display and no dogs or bicycles are allowed. Photographs of the vehicles are welcomed and talking with the owners of the vehicles is something they seem to enjoy. 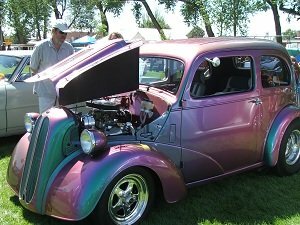 Thirty-three years ago there were six men with a dream to have a car show held in Alamosa. To help get their dream started, each of the six men donated $100 to the initial fund. That first year over $3,000 was raised though fundraising. The first Early Iron Festival started with six men and 24 cars. Now there are over 24 members and the 30th Early Iron Festival marked 513 cars in attendance. There are vehicles from different areas of Colorado, New Mexico, Kansas, Utah, Wyoming and even California. The most common vehicle there was the Chevy Belair car. 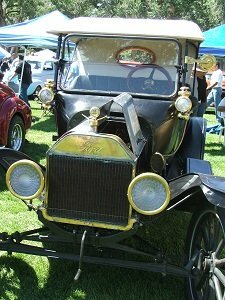 The oldest vehicle we saw was an 1879 model T which was in mint condition. My (Debbie) favorite vehicle has always been the Ford Mustang and there were several Mustangs there which I would love to own. 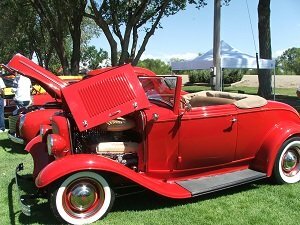 Cars are displayed for the public to view on Saturday between the hours of 9:00 a.m. until 4:00 p.m.
Saturday evening the car show participants are invited to an evening meal in Alamosa. 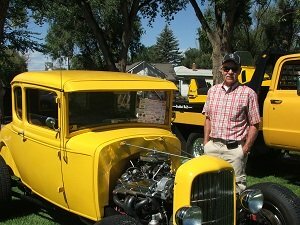 At 8:30 p.m. Alamosa's downtown main street is closed for the participants to drive their classic vehicles through town. It is a fun evening where spectators bring lawn chairs and enjoyed watching the classic vehicles cruise main street. 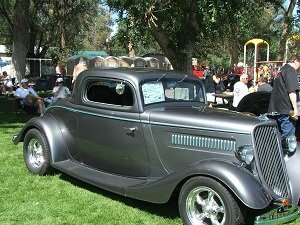 For viewing purposes, Sunday is not a day to view the automobiles in Cole Park as many participate in a Group Poker Run throughout Alamosa. What happens in a Group Poker Run is you are trying to get the best poker hand. When you sign up (costs money) you are given a card. You then drive to various predetermined locations and there you draw another card. At the end of the day the player with the best hand wins! Just like in poker. This year’s poker run (2011) began at the Inn of the Rio Grande and included five stops through Alamosa ending at the Bridge on the west side town. I’m sure this was a marvelous time for the residents of the assisted living facility to see cars which at one time they probably owned. 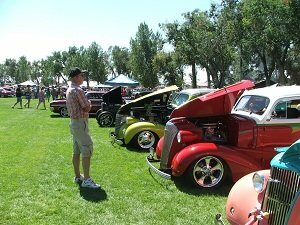 Even if you aren’t a “car junkie”, the Early Iron Festival is still a wonderful experience to participate in. It was entertaining listening to many of the spectators talking about the size of the engine, horsepower, and all that sort of information that I really knew nothing about. My part of the Early Iron Festival was to decide which color vehicle I liked the best. And that was a very difficult decision I found as there were so many richly painted automobiles. 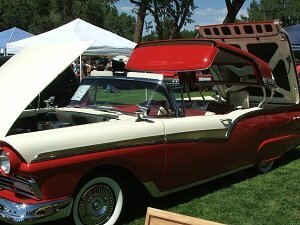 One of my favorites was a 1957 Ford Retractable Hardtop owned by a couple from Rifle, Colorado. I did not know that there was such a thing as a Hardtop convertible. It was quite the fascinating automobile. Plan to spend the entire day looking at the many different classes of automobiles. There is plenty of concession stands selling such things as turkey legs, Haugen lamb, sausage, a homemade ice cream booth by the Early Iron Tractor organization and plenty of different drinks. The organizers of the Early Iron Festival also have great t-shirts available for sale. The Alamosa Senior Citizens, just to the north of Cole Park, provided a great breakfast including biscuits and sausage gravy, scrambled eggs, and a drink. Just remember to apply a generous portion of sunscreen and even wear a hat to protect your skin.